Let's end this week with another famous name: AKG and their reference-class K 702. Our opinion about its little brother, the K 271, was pretty balanced: it has a very detailed high-end but a too weak low-frequency range. What about the K 702? 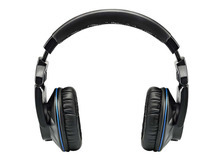 The Ultrasone Pro 550 didn't convince us when we compared headphones under $150. But the brand is famous for its high-class headphones. So what about the Pro 2900, the flagship in the Ultrasone product range? Our Headphones Week continues with the Beyerdynamic DT-880 Pro, the big brother of the DT-770. Having the DT-770 as a reference, we had high expectations for the DT-880... Verdict! Sennheiser HD650 Mini-Review - Really HD? It's Headphones Week at AudioFanzine and this Sennheiser HD650 review is the first one in a series of five reviews. Five different headphones will be reviewed by three of our editors, Los Teignos, Red Led and Will Zégal. Audio-Technica's ATH-ANC3: The Test - Double Isolation?